According to a new report by the Prison Policy Initiative, Oklahoma has now surpassed Louisiana as the largest incarcerator in the United States by rate. Louisiana’s fall in the incarceration rankings was anticipated by many proponents due to the historic criminal justice reforms that were passed in 2017. Additionally, recent reports coming from the Department of Corrections show that public safety has not been affected negatively from these recent releases. Just as planned, Louisiana prisons now have a greater portion of prisoners with convictions for violent offenses, allowing more focused effort on individuals who pose a greater threat to public safety. This is a great sign for things to come for Louisiana’s corrections system and the efficacy of these and future reforms. Louisiana and Oklahoma have been neck and neck in the top two rankings for some time. John Simerman of The Advocate points out in his recent article that Oklahoma is incarcerating 719 people per 100,000 residents versus Louisiana’s rate of 712 per 100,000. While this margin of difference is slim between the two states, it is a key indicator of what can happen when adequate reforms are implemented and when they are not. As my counterpart, Andrew Speno, State Director of Oklahoma, comments in the Simerman article, Oklahoma’s attempt to reform their criminal justice system fell short in 2017. Even though new legislation was signed into law in 2018, the incarceration rate is expected to keep rising (albeit at a slower rate) due to some changes made to Governor Fallin’s Task Force recommendations. Additionally, Oklahoma continues to hold its number one ranking of incarcerating women, which Speno points out is double that of Thailand. Fortunately, for the incarcerated women of Louisiana, a number of bills were passed in the 2018 Legislative session in an effort to improve their services. A study resolution, HCR 27, was passed establishing the Louisiana Women’s Incarceration Task Force. It will build upon the research gathered by the Justice Reinvestment Task Force and make recommendations for new or enhanced services for Louisiana’s incarcerated women. Oklahoma may want to take note of Louisiana’s proactive efforts in this regard. Louisiana has just released its first annual report examining the early data since implementation of the reforms began last fall, and already the state is seeing plenty of good news. The prison population has declined 7.6 percent, driven by a 20 percent decline in those imprisoned for nonviolent offenses; alternatives to incarceration are being used more. Caseloads for community supervision officers have started to come down, allowing those officers to direct their energy toward those individuals who need it most. These reforms were indispensable to Louisiana shedding its status as the nation’s prison capital. While Louisiana can celebrate briefly over the new ranking, there is still much to do to continue to build upon the initial criminal justice reforms. In her op-ed published at the end of the seventh (yes, I said seventh) special session to resolve Louisiana’s budget crisis, Stephanie Grace of The Advocate notes that Louisiana did not earn the number one incarcerator title, held for literally decades, by accident. It also “didn’t drop below Oklahoma by happenstance,” but through the “hard-fought new policies, adopted in 2017 by a rare bipartisan coalition,” Grace wrote. 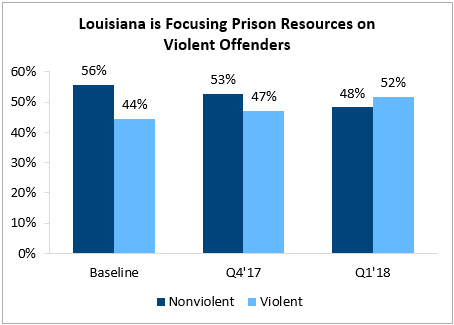 The bottom line is the Justice Reinvestment Initiative in Louisiana is now backed up by clear data showing it’s working and should be bolstered by broad support as implementation continues. Who knows, Louisiana could actually drop in its rankings again!